In December 2012, I played food guide to a few international media (Singapore, Indonesia, Hong Kong & France) who were in KL for three days. 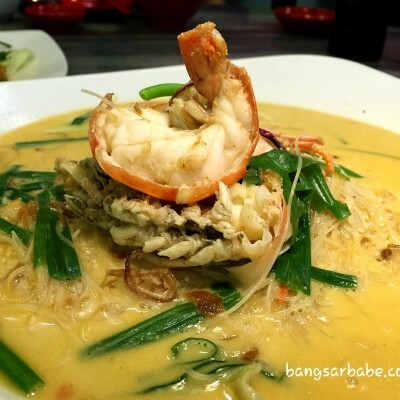 While I personally enjoy driving the distance to sample good hawker fare, I’ve learnt to take into consideration the transportation hassle tourists face in Kuala Lumpur. So the next best thing would be to recommend a place that has most of the popular hawker dishes under one roof: Lot 10 Hutong. Most of the stalls here were carefully selected and the quality is almost up to par with the original stalls. Porridge lovers can find solace in a nice bowl of ‘chuk’ at Hon Kee Porridge. A legacy that is passed down from three generations, Hon Kee Porridge has been around for more than 60 years. If you not one who can brave the heat and tuck into a piping hot bowl of porridge in Petaling Street, check out the stall at Lot 10 Hutong. I opted for the Raw Fish Porridge (RM7.80) and the fish slices were served on a separate plate. 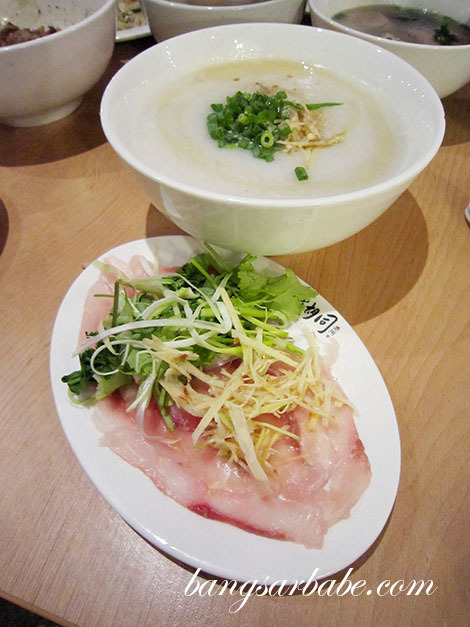 Simply add the fish slices into your piping hot bowl of congee and wait for it to cook. 5-10 seconds should do the trick. I’m no fan of congee but found Hon Kee’s version to be adequately thick and nicely seasoned. The slivers of ginger gave the porridge a mildly spicy flavour and I liked that the fish slices were smooth. 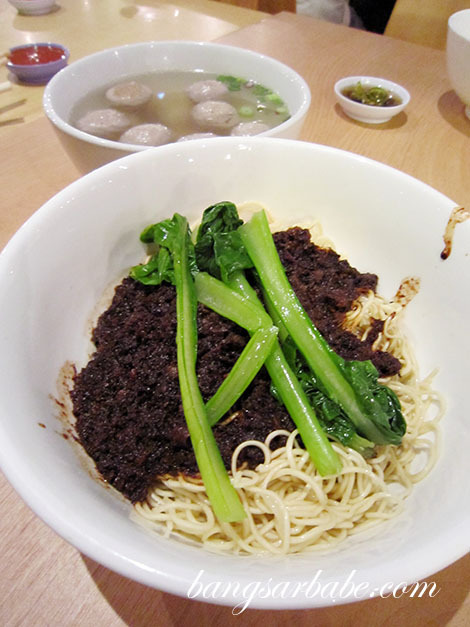 Soong Kee has been around since 1945 and is famous for its Hakka noodles, topped with beef and pork minced meat sauce, with a bowl of peppery beef ball soup on the side. It is now managed by the son of the founder and the noodles in Lot 10 Hutong are just as tasty as the original outlet in Jalan Silang. My beef noodles (RM10.50 with beef tripe) were springy with a good, toothsome bite. The noodles had little or no alkaline smell and the minced beef topping was tasty with a lovely umami flavour. Also tasty were the beef tripe; tender and almost spongy. You can opt to add more tripe to your noodles for an extra RM3. The beef balls had a springy texture. I was told the beef was pounded until thin and tender before being processed into balls. Very succulent and might possibly bounce off the table if you tried experimenting. But I’m not going to bother as it would be a waste of beef balls. I’ve eaten the pork noodles at the actual Imbi Road several times, and the one at Lot 10 Hutong (RM7.90) is almost as good as the real deal. 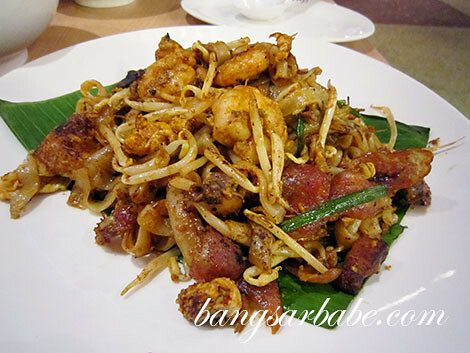 I opted for the hor fun (kuay teow), dry-style, which came drizzled with black sauce and a topping of savoury minced pork. Decent, but I thought they were pretty stingy with the minced pork. The pork balls were standard but what I liked was the ‘cheong’, also known as pork liver sausage. Savoury and meaty with a smoky-sweet flavour, a pity I was only given a small slice. 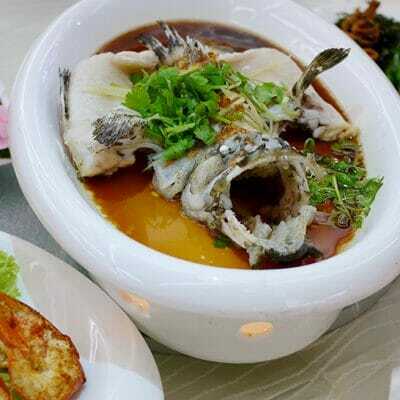 Note that the peppery soup has a pretty high MSG content, so sip with caution. Another best seller is the deep-fried pork intestines – crispy and chewy, you can order a separate portion to eat with your pork noodles if you like. 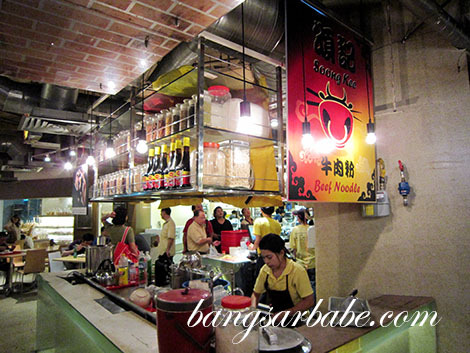 Ho Weng Kee first started out as a stall in Petaling Street and is famous for its BBQ Pork (Char Siew) Wantan Noodles. 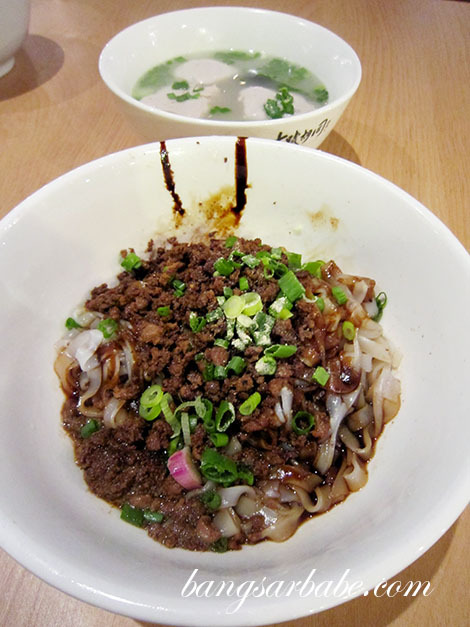 The noodles are hand-made and the BBQ pork is marinated with a secret family recipe from Guangdong. With so much hype, I obviously had high hopes. Alas, my plate of BBQ Pork Wantan Mee (RM7.90) was a disappointment. It looks good, smelt good but didn’t taste as good. To be fair, the hand-made noodles were adequately springy and had a good bite, but the seasoning was lacking. I also didn’t like that I was given slices of overly lean char siew as it was tough and dry. The wantan was decent, but nothing fantastic. They also sell Roasted Drumstick Noodles and 5-Spice Beef Brisket Noodles if you’re not a fan of BBQ Pork. Char kuay teow with egg is good but char kuay teow with duck egg is even better. I spotted the Chua Brothers stall and decided to give the char kuay teow (RM9.80 – with duck egg) a try. To be honest, I didn’t expect this to be good. See, I’m one of those cynics who think street food in a shopping mall won’t taste like the real thing. It turned out to be pretty good. The noodles tasted as though they had been dancing in the fiery flames of the wok. In other words, the char kuay teow had a good wok hei and the duck egg gave it a richer flavour. 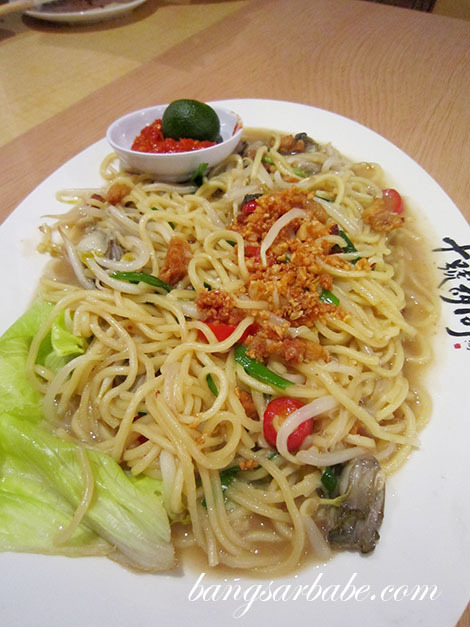 I liked that the noodles came on a base of banana leaf, which imparted a fragrant aroma to the noodles. If you’re a chilli wuss, ask the cook to tone down the chilli as the spicy version is really, quite spicy. 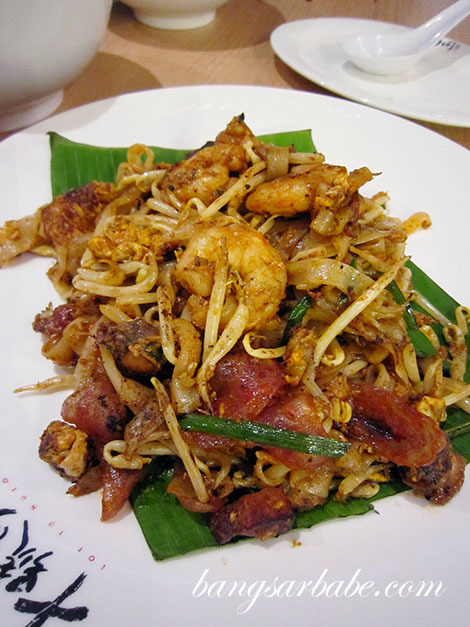 My only gripe about this char kuay teow is the scant amount of cockles given. The ice kacang (RM4.50) from Oriental Dessert was nothing to shout about. While they were pretty generous with the ingredients, I found the ice shaving too coarse. There wasn’t enough ‘lemak’ from the evaporated milk and the red syrup was a bit of an overkill. 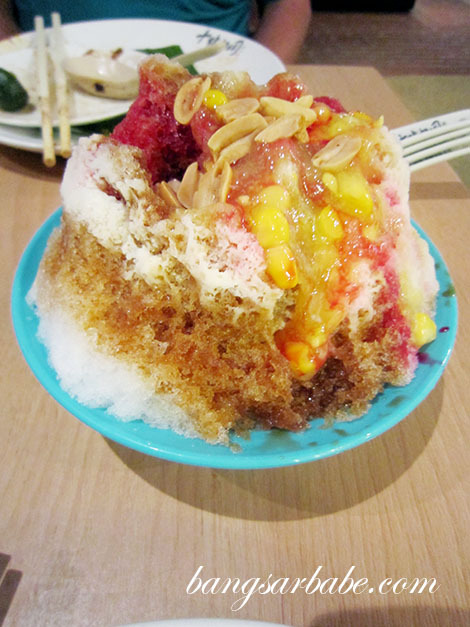 I’m generally quite picky with my ais kacang, so you might find it quite decent. I prefer mine to be milkier and less sweet. The bubur cha cha is pretty decent – mildly creamy and not overly sweet. I enjoyed the yam and sweet potato cubes as they were cooked just right, resulting in a soft but not mushy centre. Pretty good, this one. The Kim Lian Kee stall in Lot 10 Hutong is quite popular with the crowd, but to be honest, I don’t see the appeal. Established in 1927, it is now run by the 4th generation of the family. The highlight of this stall is the use of charcoal fire to cook the noodles. This method ought to produce a good wok hei, but my Hokkien Mee (RM7.80) had little or no wok fire. To be fair, the noodles tasted decent but there just wasn’t enough ‘oomph’ in the flavour. There was a fair amount of pork slices and the sambal did help kick the spice level up a few notches. 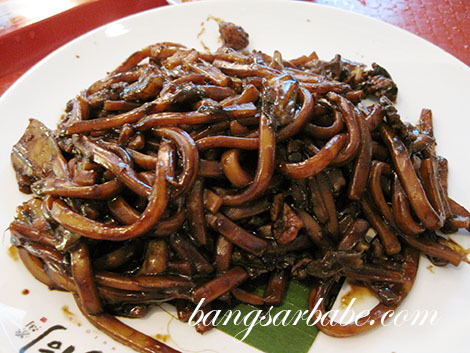 Singapore Hokkien Mee is different from the Hokkien Mee from Kuala Lumpur — refer to Kim Lian Kee. 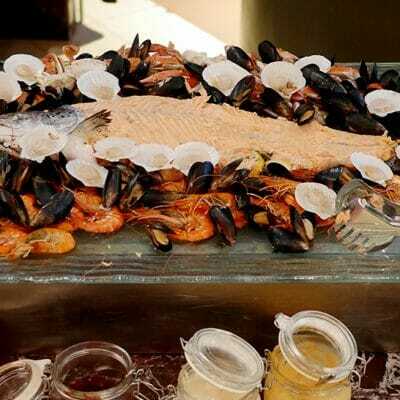 This version is wetter and comes with seafood, egg and pork lard. It used to be good when the stall first started out, but standard has dropped tremendously. During my recent visit, I was dismayed when the noodles were overcooked and soggy. If you get them on a good day, the noodles are quite enjoyable especially with the tangy sambal chilli. Mr Siew Bao is said to be the branch of the famous Kee Mei Siew Pau in Seremban. The char siew pau was quite good and had a good amount of minced pork inside. The pastry was light and slightly crumbly, while the filling was savoury and porky. Don’t bother trying the curry char siew pau though. There was very little curry flavour and the filling was scant. The egg tarts are decent and I like the Portuguese egg tart best as the filling is creamier and there’s a caramelized layer on top. 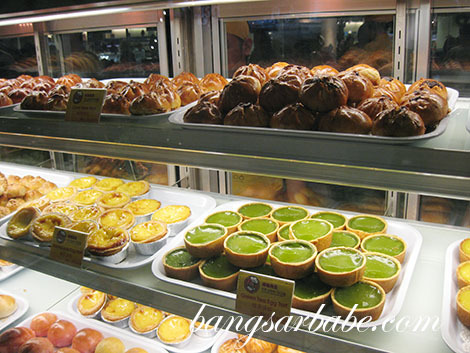 If you’re more adventurous, try the green tea and durian egg tart. Verdict: Lot 10 Hutong boasts a good variety of Malaysian hawker fare at reasonable prices and similar quality. Thanks for the recommendation. Will seek your pointers when I go Seremban ya! Yeah, the wantan mee at Ho Weng Kee was terrible. Time to petition for char siew! Charlie and me always go there for their pork noodles! so sure got something to eat.. can’t complaint le.. Ya, ventilation isn’t great. But still bearable for me hehe.